The Met Office Hadley Centre's mean sea level pressure (MSLP) data set, HadSLP2, is a unique combination of monthly globally-complete fields of land and marine pressure observations on a 5 degree latitude-longitude grid from 1850 to 2004. This product is also available in an updated form using NCEP/NCAR reanalysis fields, giving the near real time product, HadSLP2r. Please note that the HadSLP2r updates (from 2005) are not homogeneous with the 1850-2004 series. The means of the two series are homogeneous, but the variance in the HadSLP2r product is larger than that of HadSLP2. We have therefore also made available a version of HadSLP2r with its variance reduced to be consistent with that of HadSLP2. This is available in NetCDF and in pp format on the download page, along with documentation. 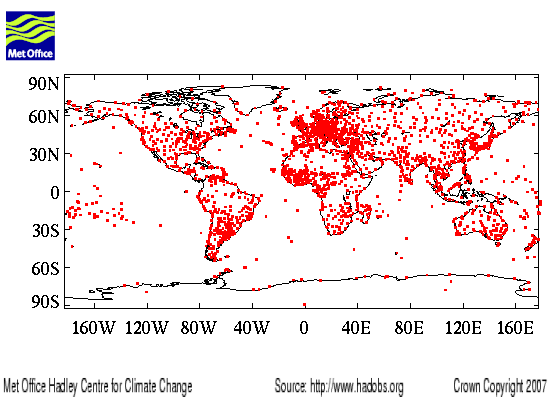 HadSLP2 was created using marine observations taken from ICOADS and land (terrestrial and island) observations from 2228 stations around the globe (see Figure and list of stations ). These land and marine observations were blended and the pressures reconstructed using a reduced-space optimal interpolation procedure, followed by superposition of quality-improved gridded observations onto the reconstructions to restore local detail. HadSLP2r was created using monthly NCEP/NCAR data fields adjusted to account for the differences in climatological averages between the HadSLP2 and NCEP/NCAR products. Please cite this paper when using the dataset. HadSLP2r should be cited as a near-real-time update of HadSLP2, using the above reference.